Unattractive apartments galore in Monaco, seeming to grow out of the hillside. We were up on the Rocher, looking down over the harbour. These apartments surround the port, so they have a wonderful view. But look closely and amongst the horrid buildings you find the odd gem. Sadly, when these villas come up for sale, they are often knocked down to make room for yet another massive apartment block. The late Prince Rainier III was known as the 'Builder Prince' and it was during his reign that Monaco grew so massively. He built, for instance, the area of Monaco known as Fontvieille on land reclaimed from the sea. At Fontvieille, you find some beautiful blocks of apartments, not like these. This is a view of Monaco I'd probably never have shown you, simply because I don't like it. Nathalie shows you the truth! Tomorrow: We visit the famous cellars of the Hôtel de Paris - this is a treat not to be missed! I's true that in view from the sea and from above, monaco is a sweltering city, but when you are inside you feel it less! This is a view that I never thought I'd see in Monaco. But it's kind of reassuring to know that not everything there is for the rich and famous only. I read a guidebook description of Monaco that began with the question: "How many millionaires can you fit on the head of a pin?" I am looking forward to your posts about the Hotel de Paris. I hoe you will tell the story of the wine cellar during World War II. If you don't, I will. Seems urban blight is everywhere. Wow, another amazing photo. You are so right, Nathalie has a wonderful eye for photography. 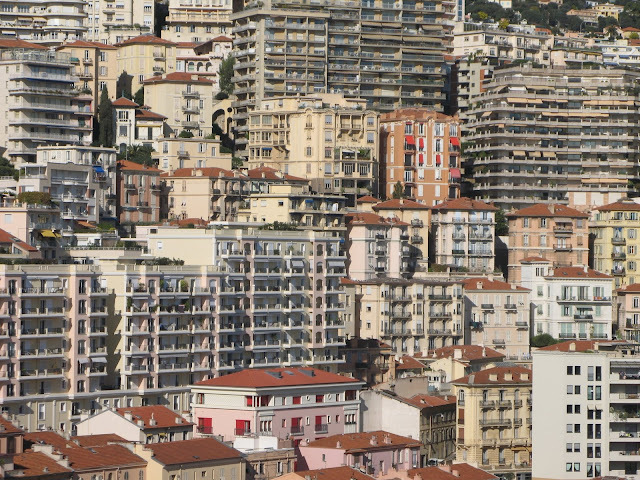 Wow - I guess we don't realize that overcrowding can take place even in beautiful Monte Carlo, right? My gosh I had no idea. Only been through on the train to Ventimiglia and it didn't seem as built up as this. The overcrowding is astonishing! I had no idea. That's amazing. What happens when all the people who live here get out on the streets? not what I would expect in Monaco either. I need my yard with my cactus and trees and flowers. this concentration of condos is probably why so many who live there are on the streets and in the parks. A density I'm not comfortable with either. Views to the sea somewhat do it for those lucky enough to have it but I'd hate to live in one of the apartments that only have street views.